Outside of these industry demands, Morrison was also about to become a father, his wife Janet Planet was then pregnant with their first and only child. Under distinct pressures and backed into a corner, Morrison did what he did best: deliver the goods while remaining his unmistakably eccentric self. The new songs would, of course, be informed by dreams and visions; a casual fan of the record might be surprised if you told them that the tracks on Morrison’s 1970 LP Moondance contained instances of young boys experiencing religious ecstasy merely by sipping water or a recounted dream in which singer Ray Charles is gunned down in public, only to get up and declare he’s A-OK. Somehow, in defiance of conventional wisdom, it all works. The album would solidify Van Morrison as an FM radio mainstay, act as a midwife for the burgeoning genre of “soft rock,” and help usher in the ’70s in America, where the beautiful hippie couples of the late ’60s would soundtrack their developing newfound domestic comfort with the sweet sounds of Morrison’s mystical love-anthems. But before any of that could happen, Morrison would need to fire everyone who had helped him create his 1968 masterpiece, Astral Weeks. Van the Man was tired of floating in space; it was time to dance. “Van fully intended to become [Bob] Dylan’s best friend,” Janet Planet recalled of the couple’s move to Woodstock, New York in the lead up to Moondance. “Every time we’d drive past Dylan’s house… Van would just stare wistfully out the window at the gravel road leading to Dylan’s place. He thought Dylan was the only contemporary worthy of his attention.” Even if Morrison had dared to wander down that hallowed driveway, it was a moot daydream: Dylan had recently moved out of town. What was left in his wake was a house for Van and Janet on top of a mountain with no running water and Dylan’s former backing backing band—the Band—who treated the Irish singer like a drunken court-jester with some peculiar musical ideas. When Morrison would travel down to Manhattan, he’d sit in Warner Bros’s George Lee’s office and try to express his frustrations without much success. “[He would] just sit and not talk,” Lee recalled, “he wanted to say things, but he didn’t say them.” The only place anyone could count on a fully lucid, expressive, communicative Van Morrison was inside one his own songs. On Astral Weeks, it was producer Lewis Merenstein who did most of the communicating for the singer when tape wasn’t rolling. Merenstein had chosen which of Morrison’s songs would appear on Astral Weeks, the players who would back Morrison up, and even the final album sequence. Morrison’s revisionist history in regards to this artistic collaboration would reach its apex in 2009 when he glibly told radio host Don Imus that all Merenstein did during Astral Weeks was fetch the musicians sandwiches, but in 1969, Morrison’s rejection of his producer would be protracted and painful. Sessions for Moondance began at Century Sound studio with most of the musicians from Astral Weeks and engineer Brooks Arthur back on the boards as well. In one outtake from these first sessions, you hear Morrison beg Arthur to let him out of the isolation booth: “I feel separated in here. Can’t I go out there and do it?” “I hate to sound like a bad guy,” Arthur tells him, “but it’s not gonna work.” Arthur couldn’t have known it, but his assessment would soon extend far beyond Van’s geographical placement in the studio. By summer 1969, Morrison had excised the Weeks players from the process and began to pull away from Merenstein, too. Suddenly, the painfully shy man who could barely look at or talk to his musicians on his prior record had started firing players, selecting new ones, and doing something that was almost unheard of at the time: producing his own record. “Van certainly had much more sense of himself,” Merenstein recalled. “He had more confidence.” Merenstein was heartbroken, Morrison was emboldened. Out went the jazzers, in came the horn section and the big choruses. The only finished song on the record that would bare Merenstein’s fingerprints at all was the title track. Now so ubiquitous that one has to consciously focus to experience it as anything more than the audio equivalent of wallpaper, “Moondance” was belabored over in the studio, attempted dozens of times in different tempos and styles before finding its sweet spot. “It’s so strong you almost can’t mess with it,” said musician Jef Labes of the track that has become the official anthem of your cousin dancing with his new bride at their wedding. Morrison was especially proud of this new “sophisticated” composition, noting that even Frank Sinatra could perform it. Morrison had more bold moves up his sleeve. For album opener “And It Stoned Me” the singer invokes the universal term for being high on drugs and then proceeds to paint vignettes that had nothing to do whatsoever with chemical intake. “I went to this little stone house, and there was an old man there with dark weather-beaten skin, and we asked him if he had any water,” Morrison recalled about the real childhood encounter that inspired the song. “He gave us some water which he said he’d got from the stream. We drank some and everything seemed to stop for me. Time stood still. For five minutes everything was really quiet and I was in this ‘other dimension.’ That’s what the song is about.” It’s worth noting that Dylan’s Blonde on Blonde and Moondance both open with a track repeatedly referencing the “stoned” term, but while Dylan’s usage couldn’t be more tongue-in-cheek, and is sung with a billboard-sized wink, Van Morrison is sincerely wailing about the time that some stream water caused him to enter another dimension. You tell me which one is the braver artistic move. 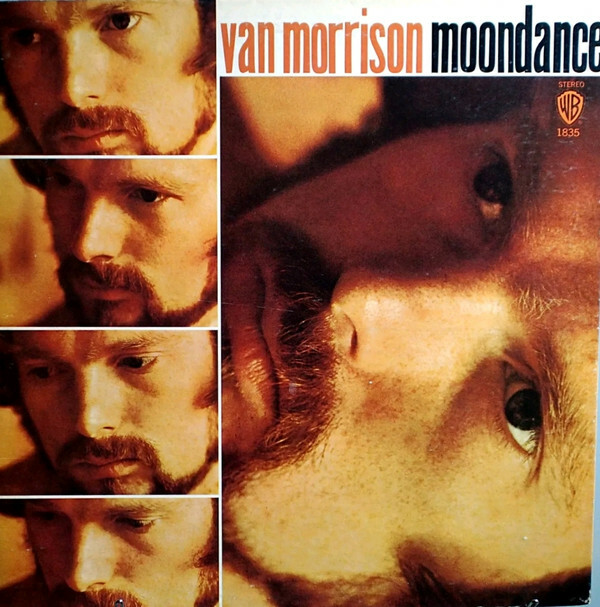 Morrison’s lyrical interests on Moondance turn towards the preoccupations of gypsies and sailors. For someone so far from home and constantly on the move during the time of writing the album, it doesn’t take Sigmund Freud to piece together why these lifestyles suddenly became such an accessible lyrical touchstone for the songwriter. One of these transient-songs, “Into the Mystic” functions as the album’s moving-spiritual-quest-centerpiece, just as “Madame George” did on Astral Weeks. “Into the Mystic” is such a soothing and reassuring track that a poll conducted by the BBC in the late ’90s found that it had become—no joke—a popular song for surgeons to listen to while operating on patients. In classic Morrison form, his explanation of the meaning behind the song is both so bland and broad that it could be applied to literally anything, anywhere, at anytime: “I guess the song is just about being part of the universe.” Ain’t that the truth. Elsewhere, the Moondance version of “Caravan” now seems forever tame and reserved in comparison to its infamous live take performed at the Band’s 1976 The Last Waltz concert, filmed by Martin Scorsese and released in 1978; it would not be an exaggeration to call this the “definitive” version of this Morrison classic. While it has become a popular pastime of music fans to conjecture “who’s on what drug and how much” during the various performances in Waltz, what’s most evident in Morrison’s “Caravan” performance in the film is witnessing someone who has finally been accepted by his peer group and is completely exuberant about it. No longer the Band’s drunken mascot, Morrison’s delivery here is nothing short of show-stopping (there’s a reason his stage-exiting high kicks have become such a mainstay GIF on social media). Add on top of this the fact that Morrison is literally singing about building a circle of friends that will stick by his side (“And the caravan has all my friends/It will stay with me until the end”) and you’ve got one of the most triumphant, redemptive moments in rock’n’roll. Robbie Robertson and Rick Danko even seem to exchange a look as he leaves the stage that conveys, “Wow, what the hell was that?” Who needs cocaine when Bob Dylan might be watching from the wings as you defiantly mispronounce radio (“rah-dio”) and bust-out the most soulful, electrifying performance of the star-studded concert? Side note: he might have also been on cocaine. More Dylan dot-connecting occurred when it was time to take the cover photo; Elliott Landy, fresh off his iconic snapshot used on the cover of Nashville Skyline, was dispatched to capture Morrison for Moondance. “When I went up to his home on the day of the photo shoot, Van had a large pimple in the middle of his forehead,” Landy recalled, “so I had to photograph him up close cutting off the top of his forehead.” Behind every iconic image, dreamy liner note, and romantic torch song is a less than pristine reality, it seems. “Something’s been made; it stands; it won’t be broken down,” Greil Marcus and Lester Bangs excitedly announced in Rolling Stone’s review of Moondance in March of 1970. Both critics were already fans of Morrison and especially Astral Weeks, and it’s heartening to read their enthusiasm extending to the well-earned success that was awaiting Morrison around the corner. “This one will be immensely popular,” they wrote. “Van’s picture already fills the windows of record stores and his new music is getting more airplay on FM stations than anything in recent memory.” In July 1970, Morrison, clad in sunglasses, appeared on the cover of Rolling Stone. It was too late to stop now; Van Morrison was about to become famous. “Make dreams come true if we want them to,” Morrison sings on the album’s penultimate track, “Everyone.” For the singer from Belfast, the long delayed dream-come-true would become an ongoing Catch-22. Finally, Morrison could provide for his new family and create the precise kind of music he wished to make, but there was a downside to the success. “Being famous is not great for the creative process,” Morrison said in 2015. “Not for me, anyway.” In 1973, Janet Planet left Van Morrison. Their daughter, Shana, a singer like her father, often opens for Morrison at live concerts. When, in 2013, Warner Bros. announced an expanded edition of the album that, by that time, had gone triple platinum, Morrison’s response was almost predictable. In a moment when he could have celebrated one of his greatest triumphs, he could only recall the behind-the-scenes business dealings that soured the set of gorgeous songs for him over the decades. “My management company at that time gave this music away 42 years ago,” he announced on his website, “and now I feel as though it’s being stolen from me again.” He told his fans not to buy the new release. Just like the teenyboppers at the Whisky had in 1969, his plea went unheard. Some things never change.